Though its a long weekend for me as I am off today it feels like the weekend sped by too quickly. Everything being shown is listed below and with that I wish you all a great week. Hope you all had a wonderful weekend. 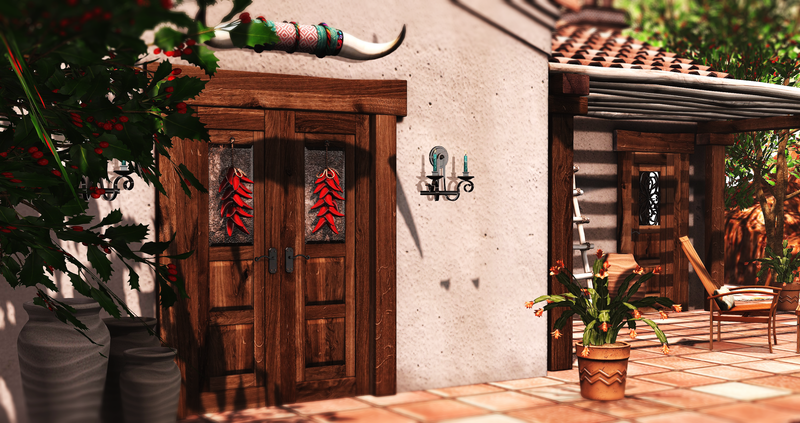 Today’s picture is showcasing cute decor from this round of FaMESHed and the Arcade. Things are bit wild at my house right now. Some of us doing last minute shopping, others baking and prepping for tonight and tomorrow in between all the other stuff that needs to get done. Though I wanted to take the time to wish each of you a very Merry Christmas. May your time be filled with joy, warmth and blessings. Please be safe throughout. Everything for my scene is listed below, so check out the credits. I will not be posting again until after Christmas. Empty Beer Lying by ..::THOR::.. I spotted this house on Flickr and was immediately drawn to it because of the red chili peppers. I make no secret of my Mexican heritage and my love for our culture. Chili peppers is a common ingredient for many foods my mother and my grandmother makes. I don’t make as I rarely cook and while I love many traditional things I am not a big fan of a lot of Mexican food. I know. Trust me. I get poked fun at by my family. 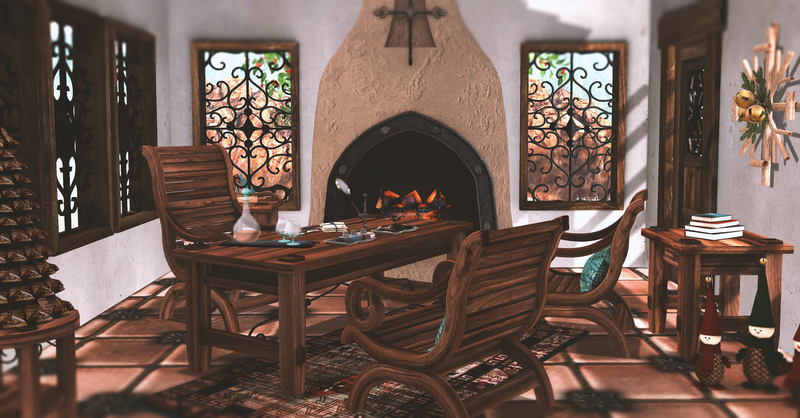 This gorgeous home is by Artisan Fantasy, a brand that is known for crafting home furnishings, indoor and outdoor decor as well as for the garden. This was a recent previous release, which can be found at the main store. It is a gacha and I have provided the link to the key below in credits. I’ve combined it with writing desk gacha as well as other pieces from this store. 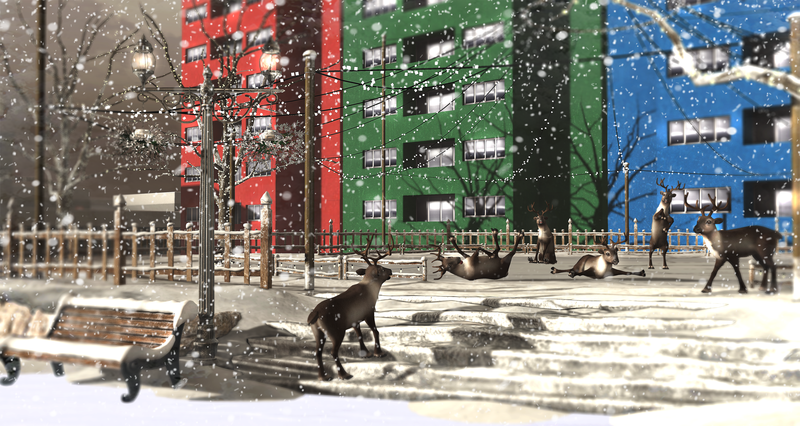 The Christmas decor you find in the last picture can be now be found at a discount at the Redeux Event, which is a bi-monthly event that features new and old releases at a discount. I enjoy visiting the event as I often find stuff I missed from fantasy and role-play events. Hope to show you more decor from this brand in the near future. The Arcade just opened its doors and so many beautiful holiday decor. Besides the street lamp from Madras available at the main store, the rest is from the Arcade. I’ve included gacha keys for you to see the whole set as I’m only showing 2 to a few items from each set. The reindeers are so much fun, so I encourage you to check out the video too so you can see for yourself. The leaves are definitely changing, because tomorrow I start my winter posts. I have a line up ready. In the meantime enjoy my last fall post, which I got to share with the lovely Kimmy, who is one of the sweetest people I know. She was super fantastic in helping me put together this scene. You can see her version at her blog, the “Lookbook“. 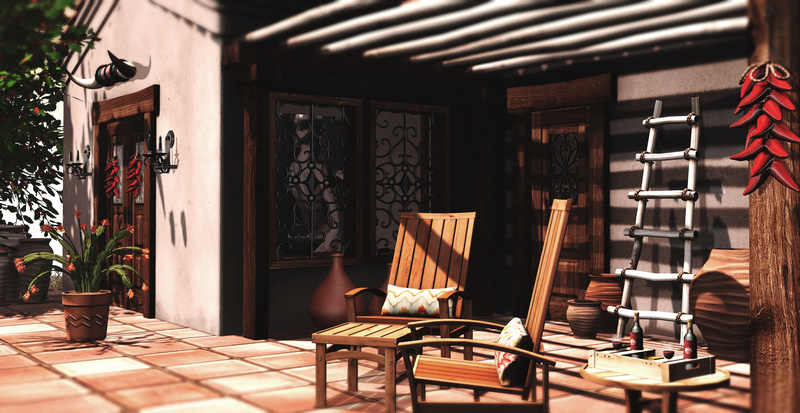 Also, check out the latest home by Trompe Loeil. 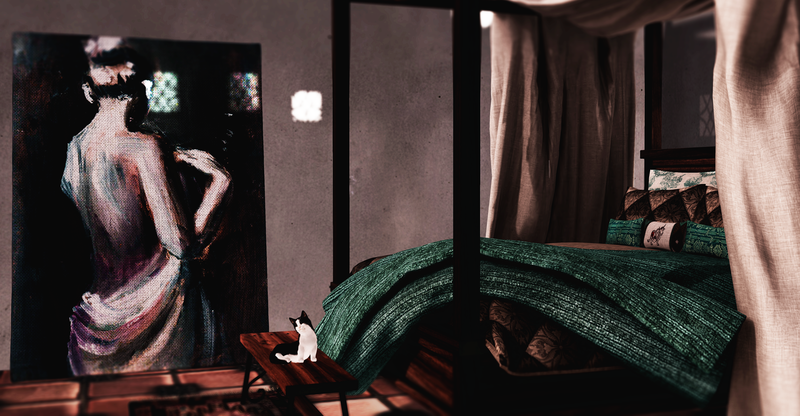 It’s currently available at this round of Collabor88, and for more information and pictures visit the creators Flickr. Shoes: Taylor.Booties (Coal) – Maitreya by fri.
Big Potted Plant by ..::THOR::..
JIAN Boston Terrier :: Wanderer – Rez me! Licking Red Cat by ..::THOR::..
Time is going fast now, even though the days seem long. This week is Thanksgiving and once that goes by its full swing into the Christmas season. I am holding out on winter scenes and Christmas ones until after Friday, then I’m shifting into that mode as well. I can’t hold out much longer, I have posts that need doing. Until then it’s still the fall season and all cozy warm stuff the next few days. Today I’m showcasing fashion in everything that I’m wearing, so take a look below for all the details.